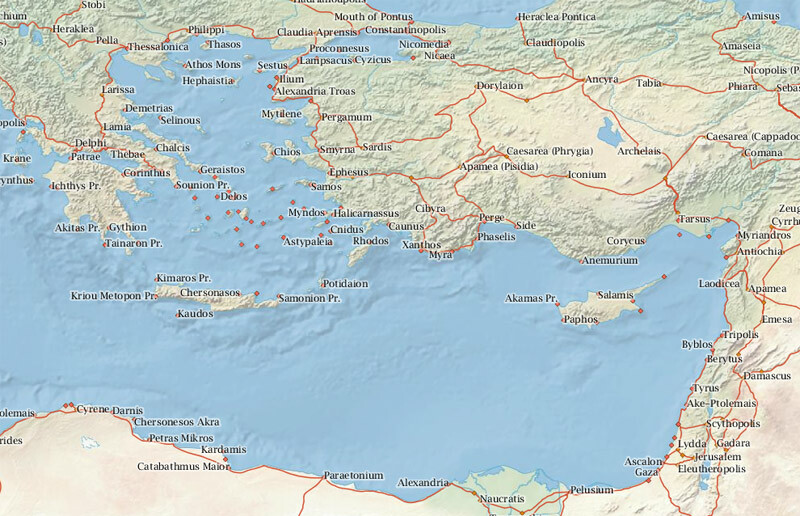 Stanford University recently unveiled ORBIS, a site that lets you calculate the time and cost required to travel by road or ship around the Roman world in A.D. 200. It takes into account a lot of factors—my favorite is that it models ancient sea routes based on historical sources and wave height. The apostle Paul went on three missionary journeys from A.D. 46 to 57, traveling around much of Asia Minor and Greece. In 60, he was also taken to Rome. ORBIS allows us to calculate how long these journeys would have taken in pure travel time (excluding time spent at each destination) and how much they would have cost. * Ship travel only. According to Wikipedia, the denarius from 200, used here, is roughly 22% weaker than a denarius from the mid-first-century. The journeys get progressively costlier as more of each journey happens by ship. Sailing is fast but expensive—of course, Paul and his companions may not have had to pay the full fare. I like to imagine that Paul’s overnight escape from Thessalonica to Berea was partially by riverboat (though the costs above assume it was by road). Not much of the route of Paul’s journey is in doubt—Luke describes the trips pretty precisely in Acts. About the only question is whether Paul traveled from Berea to Athens by ship or by road. The above costs follow the ESV Study Bible and assume it was by ship. For more about Paul’s missionary journeys, Dale Bargmann has written a good walkthrough with maps and photos. Download the raw data (Excel). This entry was posted on Thursday, July 5th, 2012 at 8:48 pm	and is filed under Geo. You can follow any responses to this entry through the RSS 2.0 feed. Both comments and pings are currently closed.